The party is over. The summer holidays have whizzed by and a new school year is upon us. For this beach bum mum who loves her lazy sleep ins and long, loose, languid, unstructured days frolicking in the ocean with her kiddies, I can assure you that early morning rises, gun-to-the-head time pressures and ferrying kids around like a taxi driver, ain’t a welcome change. Rectangular and square leak-proof stainless steel lunch boxes with removable dividers. Sold at Broth Bar & Larder. I love the quadrangle ones because I can ensure that ¾ of what goes into my kids’ lunch boxes is vegetables and ¼ is protein. I simply remove the divider when packing a salad. Insulated food jars to keep food cold (e.g. yogurt) or hot (soups, broth, bolognaise, minced meat, stews). Sold at Broth Bar & Larder. Hot tip to keep food hot for longer: fill with boiling water to warm the container up, discard the water and add in the hot food. Stainless steel (not plastic!) water bottles: buy online from Klean Kanteen or selected homeware stores like Kings of Knives and organic stores. Kings of Knives also sell the spouts separately if you loose one and I also recommend replacing all of the spouts periodically as bacteria can harbour in the spouts. Glass water bottles are another option but there’s the breakage factor (Miss M learnt that one the hard way!) and also the issue with extra weight to lug around. Activated nuts and seeds: if permitted at schools, organic activated nuts are not only delicious but high in protein and ranked as the 3rd most-nutrient dense food on the planet according to the Mat Lalonde nutrient-density scale. The older grades are becoming more and more relaxed about nuts so these are making their way into my kids’ school lunch boxes in more recent years. Even if nuts are not permitted, seeds like pepitas and sunflower seeds are permitted (the ex lawyer in me loves a loop hole!). Our organic activated black pepitas come in nifty little 30g snack packs perfect for kids’ school lunches. Sold at Broth Bar & Larder or via our online store. Gruyere or Reggio raw milk cheeses: still made with 100% raw milk world-wide. Perfect to team with fruit for morning tea or can be the protein part of lunch. We sell these at Broth Bar & Larder by weight so you can buy as little or as much as you need. All other organic full fat cheese: I always keep a stash of other organic full fat cheeses in my fridge to have on hand. They will each contain different probiotics so ideally rotate between them. Eg gouda (high in vitamin K2), haloumi (pan fry), cheddar, brie, camembert etc. Purchase from organic stores. Preservative-free cured meats from Bundarra Berkshires: we sell 2 varieties at at Broth Bar & Larder: Little French Hamv and sliced hamdr. The Canadian Way wild smoked salmon: delicious to throw into a salad to make wild smoked salad or to throw into lunch boxes as is dressed with lemon juice. Sold at Broth Bar & Larder. Beware that pretty much all (if not all) other smoked salmon in Australia is farmed. Read more here. Sold at Broth Bar & Larder. I keep a stash in my freezer to pull out from the night before. Anchovies: buy from supermarkets or organic stores ensuring that they are marinated in olive oil and not vegetable oil or canola oil. Easy to throw into a salad. Other tinned fish: buy wild tinned fish from supermarkets or organic stores ensuring that they are either in brine or marinated in olive oil and not vegetable oil or canola oil. BPA-free tinned wild fish sold online from Vital Choice. Easy to throw into a salad or can be eaten straight from the tin. Preservative-free beef jerky from Kooee made from 100% grass fed meat and spices. 3 varieties sold at Broth Bar & Larder. Cleavers paleo sausages and meat balls: I keep a stash of frozen ones in my freezer to pull out when needed and fry up the night before as part of dinner with extra for school lunches. Full fat unsweetened yogurt made by Bondi Yogurt sold at Broth Bar & Larder. I also like the Meredith sheeps milk yogurt sold at organic /health food stores. For our dairy-free friends, an unsweetened probiotic-rich coconut yogurt made by Bondi Yogurt is also sold at Broth Bar & Larder. Fresh vegetables: buy from your local farmers market or organic stores. At a minimum I try to have in my crisper drawer at all times some cucumbers, capsicum, cherry tomatoes, carrots, celery and some salad greens. Left over veggies (make more steamed/roasted veg from the night before), thinly sliced radishes, raw fennel and cooked and cooled potatoes are nice too for variety. Mix things up as the human body LOVES variety! Olives: black olives in brine are sold at Broth Bar & Larder. If you buy marinated olives please read the label or ask if they are marinated in vegetable oils like canola oil – and if so avoid like the plague! Pickles: sugar-free pickles from Handsome Devils are sold at Broth Bar & Larder. Raw fermented vegetables: 3 varieties sold at Broth Bar & Larder. Easy to throw into a salad. Nori seaweed: let’s not forget sea vegetables and their richness in nutrients like iodine not found as abundantly in land vegetables. Remember that diversity is key and the human body wants a diversity of (real, whole) foods. My kids LOOOOVE nori. I buy from organic nori from organic/health stores and be sure that it contains only one ingredient – nori- because most brands now coat the nori in vegetable oils. Fresh fruit: I always have a few pieces of seasonal fresh fruit on hand for morning teas that I team with yogurt, cheese, cream or some other quality protein/fat source (this teaming is important because fruit and veggies contain fat soluable vitamins and minerals meaning that they need to be teamed with quality fats or proteins for those vitamins and minerals to be assimilated /absorbed in the body. Secondly a quality fat/protein source will help slow down the release of blood sugars from the fruit to avoid insulin spikes and crashes). I also have some fruit berries in my freezer (when I’ve no fresh fruit) to serve on top of yogurt. Bliss Balls: sweetened only with dates and no concentrated sweeteners and loaded with healthy brain-boosting and energy-giving saturated fats, these come in 3 different flavours: raw cacao, choc orange (my kids’ fav!! ), and activated nut. The first 2 flavours are completely nut free! Sold at Broth Bar & Larder or via our online store. Gummies: these come in 2 flavours and are made with 100% grass-fed gut-loving beef gelatin made by Gelatin Australia, organic raspberries or mangos and pure Canadian maple syrup. Sold at Broth Bar & Larder. Carob bears: available in the original 2 ingredient flavour or in mint flavour (infused with Young Living food-grade peppermint essential oil) , these are completely free of sweeteners and dates = guilt free! Yay! Sold at Broth Bar & Larder. Hack 5: if you can prep it from the night before do it! Fill water bottles (don’t forget to add that pinch of salt) and pop straight into school bags. Chop veggies or add leftover dinner into lunch boxes. 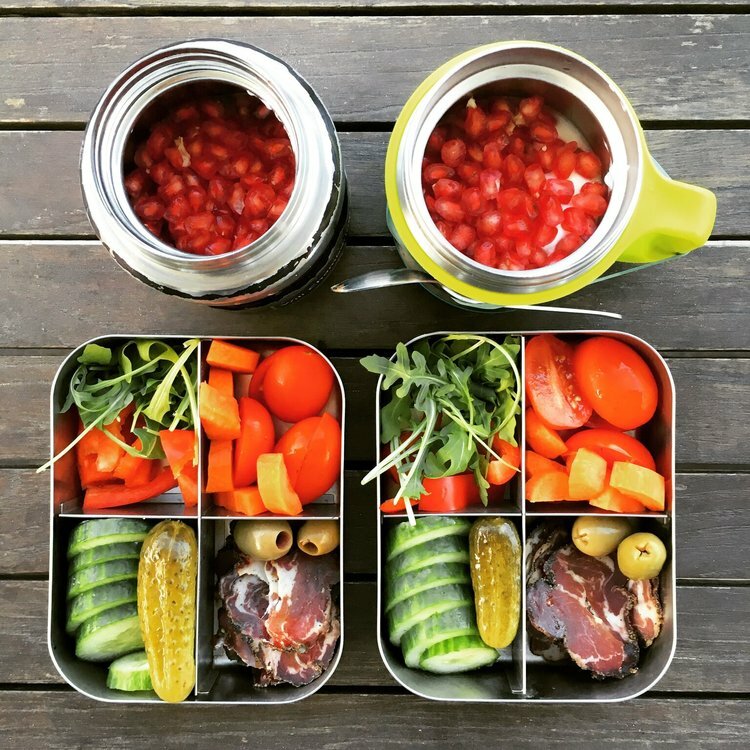 To become a lunchbox pro, check out my SCHOOL LUNCHBOX INSPIRATION ebook where I will share with you robust nutritional theory, my secret tips and tricks, school lunch and morning tea “formulas” for success, teamed with pictures of nutrient-dense, grain-free, processed food free lunch boxes. Despite grains being ubiquitous in society and especially prevalent in kids’ lunchboxes (from sandwiches, bagels, muffins, crackers, and much like sugar sneaks into just about everything in between) the truth of the matter is that no we don’t need grains to survive and in fact thrived for 2.6 million years on this planet as hunter gatherers without the advent of grains. Hence why the above 5 tips don’t include them as a daily staple in my kids’ lunchboxes. That’s not to say that my kids don’t ever eat grains as I do offer them the occasional piece of organic sourdough bread or soaked rice porridge or other grains properly prepared. However this is the exception to the rule and I prefer to fill them up with more nutrient-dense foods rather than empty fillers. Learn all about safe grains (especially gluten), why grains need to be properly prepared, who can consume them and in what circumstances, in my upcoming Food as Medicine talk or one on one health coaching session. And don't forget to check out my social media posts to see what my monkeys are taking with them to school each day. See social media platforms below. inspiring parents to raise vibrantly healthy kids one nutrient-dense mouthful at a time!